This image of a flight crew posing beside the SkyGreece Airlines Boeing 767 ER was posted on the SkyGreece Facebook page this past weekend. Excitement building: If the traffic to my blog and the number of emails I’ve been receiving recently are an accurate indication, there is a tremendous interest in SkyGreece Airlines — and especially its as-yet-unannounced schedule for flights between Athens and the United States. For months, SkyGreece has been one of the top 3 most-searched topics on my website, while during the last few weeks I’ve received more email inquiries about SkyGreece than I’ve received about any other subject in the past two years. People keep asking me when SkyGreece will launch flights to and from New York and Chicago, and also want to know what fares will cost. Some people are even asking if SkyGreece is hiring any flight crew or ground staff in the USA. Unfortunately, I haven’t been able to answer any of the questions or provide up-to-date information because SkyGreece hasn’t released any. Until this past weekend. According to a news report on the Greek Travel Pages website, SkyGreece conducted a test flight of its Boeing 7667 ER aircraft last Friday, taking a group of airline executives and officials from the Civil Aviation Authority on a flight that passed over the Monastery of Taxiarchis at Mantamados on Lesvos island. The flight was highly symbolic since the SkyGreece plane is named Taxiarchis, after the Greek patron saint of aviators. 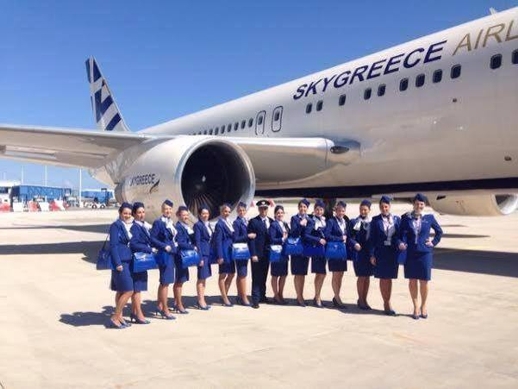 The next day, SkyGreece updated its Facebook page with two photos of the flight crew posing next to the jet. Without providing specific details, the GTP report added that SkyGreece will launch its year-round direct flights between Athens and New York City sometime in June. There will be 5 flights per week between Athens and NYC in the summer, and 2 flights per week during winter. SkyGreece also plans to offer 3 flights per week from Athens to Montreal and Toronto, and at some future unspecified time will launch service to Chicago and to South Africa. GTP said that SkyGreece has obtained its licence in Greece, and is still waiting to receive permits from the United States and Canada that will allow it to operate scheduled flights to New York and Toronto. Until those permits are received, SkyGreece will offer flights on a charter basis only. No information was provided about when the flights to Canada will commence, or what fares will cost — so please don’t email me to ask for those details! I do not have contact with anyone at SkyGreece, so I don’t have any “inside information” that I could share with you. I will post that information here on the blog if and when SkyGreece announces its schedules and prices. And if you’re interested in employment with the airline, keep checking the SkyGreece website for possible career opportunities. Today, the website indicated that applications for an E-Commerce IT Specialist, based in Athens, are being accepted until April 2. For my previous reports about SkyGreece, see my January 10 2014 post and my June 25 2013 post.